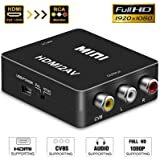 Hdmi input interface: connect to high-definition television, high-definition projectors, etc. 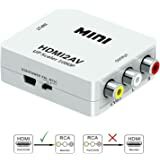 The Mini HDMI to AV signal converter which will convert HDM video signal or audio signal to AV(CVBS)composite video signal and the FL/FR stereo audio signals, while support DVI system sideline signals.To help users convert the high quality of the HDMI video signal into normal CVBS signal. So that can play on TV, VHS VCR, DVD recorders, etc and support NTSC and PAL two TV format. Notice:This adapter is HDMI to AV, Not AV to HDMI, please make sure for it before your purchasing. Ehhh...Upscaling works but picture is not great. Finicky, as sound sometimes buzzes, especially when there are fonts on the screen. DOES work to record Roku or Fire Stick to DVD recorder or other type of RCA in recorder. I can plug iPhone or iPad with HDMI out into this and record onto DVD with no blackscreen issue. The only reason I use it is so that I can record some things that are leaving Netflix or Amazon soon before I'll have a chance to finish watching the series. Also, recording shows from NBC, CBS, ABC and Yahoo view so I can FF through the commercials. Not bad for the price, but very chintzy, so be careful with it. I would recommend going with one that's a bit more expensive but if you're on a tight budget as I am, this will do the trick. 5.0 out of 5 starsPlug and play -- All the way! Received today, plug in and works perfect! So excited. 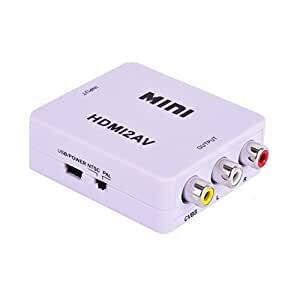 The Hdmi port on my tv got hit by lightning, so I used this to plug my Tivo into and then use the RCA jacks (red, white, yellow cords) to connect to the tv. So glad it got here today. (This one does ship from China and takes longer to receive but it is a great deal on a great product! Converter works well in converting Android TV Box HDMI output to old TV RCA inputs. However, it does get hot, so I run a usb fan by it. Still working without issues. Definitely 5 stars if was not for the heat potential issues. Bought a second one for my other old TV without HDMI input. My Hdmi port went out on my tv so I purchased this to use with a firestick. I previously purchased a different model and wasn't happy with the quality of the picture. This one is much clearer and works really well.